The hot weather begs for cold chicken that you can really get your hands into. This is yet another New York Times-inspired recipe for which I happened to have some — but not all – of the ingredients on hand so I had to adapt. I very much liked the Asian inflections in the chicken, but what I noticed most was how moist and tender the chicken stayed and how well it absorbed the flavors with the long, slow simmer. I will be trying the same technique with different seasonings in the cooking liquid in the very near future. In the meantime, do try the wrap idea at the bottom; we took it to the pool for a light evening meal and it was just the thing. I simmered this one at night when the temperature had dropped, since it was going into the fridge for the next day anyway! Link to the original NYT article at the bottom! Season the thighs generously with salt and pepper. Place in a heavy pot and add enough cold water to cover. Add the ginger, garlic, star anise and scallions. Bring to a gentle boil, scooping out any foam. Turn heat to very low, cover and simmer ever so gently for an hour. Transfer the thighs to a bowl to cool. Skim the fat off the surface of the remaining liquid. Reduce the liquid by half over high heat (5-10 minutes), then strain it over the thighs. Cover and refrigerate overnight. Serving suggestions: Sprinkle with cilantro, slivered scallions and sesame oil. Or…. Spread a wrap or your choice with mayonnaise. 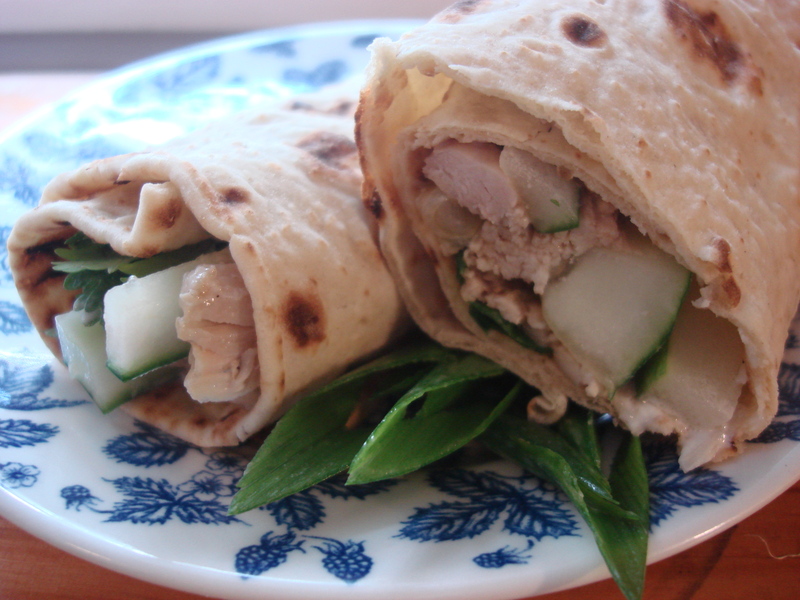 Add cucumber, sliced lengthwise, pieces of chicken, slivered scallions and cilantro. Add a sprinkle of lime/sesame oil and a drizzling of Asian Stir Fry Sauce https://hotcheapeasy.wordpress.com/?s=asian+stir+fry+sauce roll up and serve. 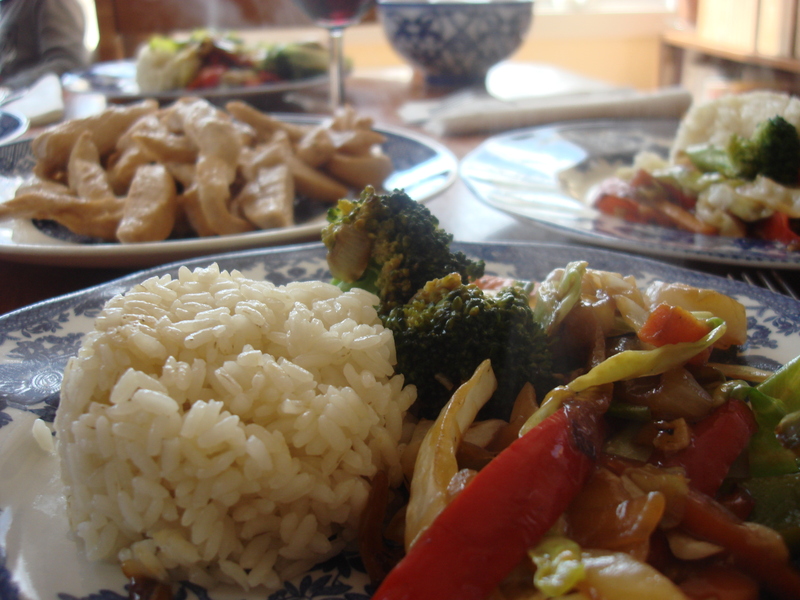 You can do the same by substituting hummus and roasted vegetables for the mayo, stir-fry sauce and cucumber. Article from nytimes.com which inspired this dish. You will note David Tanis recommends free-range birds; I used organic thighs from Costco with very good result.